TM 1-1520-240-10 3-3-29 Figure 3-3-8. 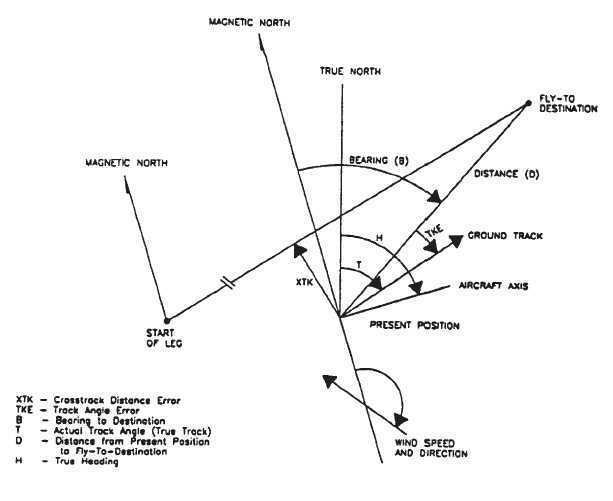 Graphic Definition of Course Terms METHOD 1 When flying shortest distance to destination from present position, set DISPLAY switch to DIS/BRG/ TIME position and steer vehicle to bearing dis- played. As an aid to maintaining course, set DIS- PLAY switch to XTK/TKE position and steer aircraft to keep track angle error (TKE) nominally zero. If the display indicates a L (left) TKE, the aircraft must be flown to the left to zero the error. METHOD 2 When flying a ground track, set DISPLAY switch to XTK/TKE position. Steer vehicle to obtain zero for crosstrack error (XTK). If XTK is left (L), aircraft is to right of the desired course and must be flown to the left to regain the initial course. NOTE Since the aircraft has the Horizontal Situation Indicator (HSI) and when the Doppler has been selected then the pilot may use the #1 needle and course deviation indicator (CDI) for navigation to the Fly-To destination se- lected on the CDU. Select CDI by depressing, then releasing the DPLR GPS lens on the HSI Mode Select PAnel. c. Procedure to Enter Route-Sequence To-To Mode The Doppler/GPS navigation set has the capability to navigate a course set up between to destinations. As an example, consider navigation onto a course start- ing from destination number 62 and ending at destination number 45. (1) Set MODE switch to MGRS (LAT/LONG may also be used). (2) Set DISPLAY switch to DATUM/ROUTE. (3) Depress the ENT key. Observe that a menu of special steering functions appears.